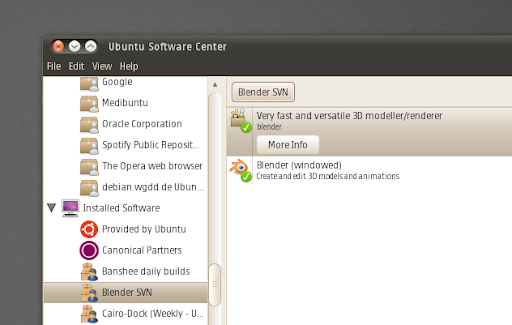 A new Ubuntu Software Center version (2.1.6) was just released in Ubuntu 10.10 Maverick Meerkat which brings some more design changes: everything in the main view is now more compact and there are no more borders separating the categories ("Departements") from the featured applications or "What's new". The new Software Center also finally displays some applications under the "What's new" category - this category is supposed to hold the new applications in the extras.ubuntu.com repository but for now I don't yet understand on what criteria the applications show up under this category. And finally: the "Installed Software" now lists all the PPAs you have from which you've actually installed some applications and only the installed packages are displayed for each PPA (but all the packages and PPAs are listed under "Get Software"). The complete changelog for Ubuntu Software Center 2.1.6 can be found here.